Years ago, I used to paint D&D miniatures and really enjoyed the wonderful detail that the sculptors put into their tiny creations. Now I’m hoping to be able to sculpt intricate creations and make duplicates to paint, sell, or give to friends. It’s quite a learning process, and there are multiple fail points at each step along the way. I need to inspect the original sculpture and ensure that it’s clean, smooth, and devoid of unintentional marks. Next, I have to create a perfect mold without any air pockets or warping. Then, I have to set up and support the mold so that it is perfectly level and will not stretch or bend while in use. After that, I have to mix up the resin, which is awfully finicky. Finally, I have to pour the resin slowly enough — but not too slowly — and get rid of any bubbles or imperfections in the few moments before the resin begins to harden. After all that, if the temperature and humidity have been just right, I just might have a usable resin replica. I sure hope that I get better at this soon. For the ArtWorks 1x1 in January, I made four tiny resin pieces and painted them with a faux copper patina. I had hoped to make a six-sided die, but I haven’t worked out how to do the final side. I poured a bit too much, but I sanded it down to look like a stand. It’s a happy accident. 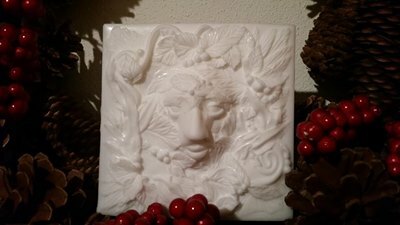 So far I’ve made two molds of this original Green Man sculpt, and I am looking forward to getting good enough at the resin that I can get back to sculpting the rest of the Green series that I have planned.